The Best Books Ever: Nerd Blast ~ An Angel Torched My Homework & Other Lies by Miche Sipes ~ Giveaway, too! 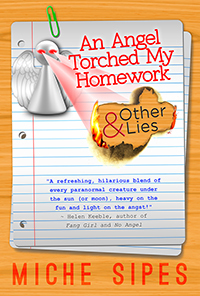 Nerd Blast ~ An Angel Torched My Homework & Other Lies by Miche Sipes ~ Giveaway, too! THE REST OF THE STOPS CAN BE FOUND HERE, at Jean Booknerd! Carrie Philips just wants her junior year at Clement Academy to go smoothly. Sure, it’s the first high school in the nation to integrate Norms like her with the Differents. But the Diffs are just typical teenagers with “tiny” genetic anomalies. They’re not really vampires or werewolves or angels or zombies like you see in old movies. The Diffs just have special dietary needs and some unusual abilities. They’re certainly not dangerous or anything—at least that’s what Carrie has always believed, since her dad is a doctor of Different medicine. But when several of her fellow students are mysteriously assaulted, cracks form in Carrie’s worldview. Cracks she tries to ignore while defending her friends from anti-Diff backlash and solving the mystery of who’s really behind the attacks. Meanwhile, she’s distracted by two criminally cute guys who both seem to like her (and hate each other). Then Carrie uncovers a bombshell that could forever change how Norms and Diffs see each other. So much for a quiet school year. Miche Sipes wrote her first play at the age of six and has been writing creatively ever since. Well, if you don’t count the occasional decade-long lapse. Miche has lived in Maryland and Florida, but now calls Colorado home. Whenever she’s not writing—or finding ingenious ways to procrastinate like ironing shoelaces or flossing her cat’s teeth—she can be found hiking in the mountains. Then again, there’s a good chance you won’t find her because she’s probably lost.